It is mid-July and has been raining for 13 days straight. The temperature has not risen above 62 degrees and my father-in-law’s words to me, “Some years, The Netherlands just stays cold all year,” are ringing like a fire alarm in my ears. My daughter’s Dutch teacher a few weeks ago said to me, “Oh, I hope we have a summer!” I feel like Pete Campbell from Mad Men talking to his secretary. I have expectations, and although they do not appear unreasonable from my perspective, perhaps in this particular environment, I am viewed as a spoiled brat. “What are you even talking about?” I want to respond, with a deathly serious tone in my voice. No summer? As if the result of the earth turning on its axis optional? It’s the equivalent to hoping the sun rises tomorrow. The secretary just shrugs and tells Pete, “I’m sure it’s nothing,” and goes on about her day. Everyone here knows this. Perhaps this is why the Dutch are seemingly unemotional. With this unpredictable weather – usually too cold, persistently windy, and consistently overcast, they have learned to not let it affect them. I, on the other hand, am about as collected as a pregnant woman – ridiculously moody and always just a tad uncomfortable. To add to the fun of completing yet more rainy day projects (a term, I’m beginning to think doesn’t really motivate or excite people like it does in the U.S., it would be like saving projects for a humid day in Houston or a sunny day in L.A.), my husband spent last week in the Ukraine. With his departure on Sunday morning and return on Friday evening - I was nervous about the looming 132-hour-shift with the kids I found myself facing. In the end, it was actually pretty successful and I used the time to get creative with the kids and myself. As the rain fell outside, we completed art projects in the morning and drew with sidewalk chalk on the front porch in the afternoons (sticking close to home so we could dart back inside when the rain fell again in the evenings). I alternated Yoga and Jillian workout videos and completed Rosetta Stone Dutch lessons. I started reading a new book and went to bed early. I think it was important for me to realize that I could keep my kids entertained for a week while maintaining my own sanity (well, for the most part) without my husband home. I do think it was lonelier than I realized, though. A lot of Expats complain about the loneliness of the experience, but I had originally found the opposite to be true. Between commuting to work and sitting in a library-like office in my solitary cube in Texas, I had a lot of quiet time to myself. Even on busy days with meetings, I typically still had an hour lunch break to sit and read or run errands by myself. Here, I am never alone taking care of my two kids around the clock, which has been one of the biggest adjustments. After V returned on Friday evening, we had a good weekend, but as the rain started to fall (again) on Monday morning, I found myself in a cloud of disappointment when his plans to work from home that day were spoiled and he had to drive into the office. As I watched my daughter decorate the letter L during “art time” that morning I stared out into the wet backyard garden and realized, perhaps for the first time, I was really kind of homesick. I miss being warm, driving, and drive-thru windows. I miss my local library and Barnes and Noble where I can drive and park to entertain my children. I miss stores that are open past 5 p.m. I miss having someone to talk to besides my children (who although, are entertaining, aren’t exactly the best conversationalists) and my husband. Poor V. I have a lot of frustrations, and he’s the one who gets to hear them all, even if they’re ahem, about him. I guess it’s good from a ‘communication’ standpoint for our relationship, but I’m sure it gets old, too. Although I’ve never seen a rainbow here (hum, perhaps the 40-days-straight of rain promise doesn’t apply here? ), I think I’m about to enter into a new chapter that’s filled with more color and sunshine, even if the rain still falls. I am soon going to have distraction upon distraction in the form of friends visiting me here in Leiden during the next few months, the thought of which, makes me very happy and filled with hope. My children, my Dad, and I arrive in The Netherlands at 8:00 a.m. in January. It’s still dark outside and I can tell through the windows of the jet bridge, that it is cold and drizzly. My Dad successfully loads our 7 checked suitcases and travel crib onto two luggage carts, while I push my baby’s stroller. My sweet 21-month old daughter must walk herself, there are no more hands to hold or carry her. She pads through customs in her footed pajamas. We near the sliding glass doors. I know that on the other side of those doors are my husband, which I have not seen in three weeks, and my new life, of two years. The frosted doors slide open. My Dad, with the help of some friendly Dutch customs agents maneuvers the massive piles of luggage and my daughter, baby, and I follow. We are all disoriented, tired, and confused. I see a large, looming, Starbucks. And then I see him, my smiling husband, and he’s holding two red tulips in his hands, one for my daughter and one for me. We walk to him and embrace. I’d like to cry out of just pure joy of seeing him again, but I’m so exhausted from taking care of my newborn baby and daughter for three weeks without him, while wrapping up my job, moving out of our home, and flying across the world, I just can’t muster the tears. I’m happy to have the trip over with. I’m anxious for what is to come next. We drive through the Dutch countryside via a large highway. We maneuver through a picturesque neighborhood and pass a large church with a clock on its tower. We drive past large, square apartment buildings which look like they were built in the 60s or 70s. Then we turn onto our street. There are three-story continuous brick homes with tiny front yards. These homes are 100-years old and survived the bombs of WWII. We pull up to our new home and my Dad is standing outside waiting in the drizzle. There just wasn’t enough room for our entire luggage to fit inside of our Dutch car and he had taken a taxi. We unload and I step inside. It is empty of furniture, but I can tell that V has made an exceptional effort to make it homey, despite the pile of cardboard boxes in what was to become our dining room. New vases of red, orange, and blue decorate the mantels and hold happy yellow and pink tulips. Luckily, our air shipment had arrived, and the card table has been equipped with a new purple tablecloth and there is another vase full of colorful flowers. There are more flowers in the sink. I slowly discover my new home. There are hardwood floors and chandeliers. There are three floors and original stained-glass doors leading from the dining to the living room. I am in love with the house and all of the unseen opportunities it holds. My daughter becomes equally excited as she discovers her stuffed animals, play kitchen, and easel are here. The house is a little cold and empty, but I’m not worried. Our furniture will be here soon. And in the meantime, well, we’ll just do the best we can. The next few days were a blur of broken hours of sleep and trips to the Dutch doctor in attempts to buy or borrow a nebulizer for my little baby. (The American imported one fried the minute we plugged it in despite our conversion efforts). He has bronchitis and I am equipped with months upon months’ supply of breathing treatments from our pediatrician in Dallas. We can not just walk in somewhere and buy a nebulizer, like we did at CVS on New Year’s Day at home. The pharmacies tell my husband over the phone that he needs a prescription. We make a doctor’s appointment and my Dad, husband, daughter, son, and I walk over to the hospital. We meet with our family doctor’s assistant (pediatricians are non-existent in this country) and attempt to explain the situation, but the doctor still refuses to give us a nebulizer that will fit the European outlets. My 3-month old baby is weezing and I am distraught that no one will help me help him breathe easier with the medicine I have. The doctor gives us a prescription for an inhaler and my family and my Dad trek over rivers and through the woods, literally, to the closest pharmacy – before 5:00 p.m., in order to get it filled. I remember visiting College Station for my sister’s graduation. After the ceremony my family headed to an apartment where most of her fellow cross-country members hung out a lot – lovingly known as the Track Shack. I had been there before, as it had been home to many members of the team for years. Think of the dirtiest college apartment you’ve seen and double it. But that particular day, when my family and I entered, we were encountered with a surprise. The boys had cleaned the apartment and had graduation presents on the coffee table for my sister. Even these boys knew the importance of impressing my parents during one of their few visits into town and into their home. My house in Leiden is far from dirty, but I want it to be perfect. I’m menu-planning, rearranging furniture, hanging curtains, buying new soaps, and getting suggestions on where to go and what to do. In all honesty, these are all things I would do or needed to do anyway, it’s just exciting to do the tasks with the intention of hosting friends soon. So while the clouds may still be looming and the rain continues to pour, I am looking forward to the other side of the rainbow, like Dorothy, linked arm and arm with her best comrades, she enters a world surrounded by friends in a newly discovered territory. I love tourists. I can easily spot them walking down the street in Leiden. The signs are all there: way too comfortable shoes (a.k.a. not boots or converse), the over-the-shoulder purse (women do use these here, but it’s while they’re riding their bikes), a nervous spring to their step, if you’re lucky, a fanny pack. Yes, I’ve seen them, which begs the question – do they still sell fanny packs or has that man been hoarding that fanny pack in his closet since 1987? I don’t know. But I love them all because I see them trying to nonchalantly review the map on the street corners while their children keep watch for the imaginary ruffians around. I want to run over to them, point them in the right direction, and really make their day. They are the only people in this city less familiar with all the inner-workings of everything than me. I did help a lost Canadian once. She walked up to me and asked if I spoke English, I happily replied “I do!” with probably a little too much enthusiasm. She was in the train station parking lot, but she didn’t know it and was wondering where the train station was. So, that was an easy question to answer. See? I’m knowledgeable. After incorporating many of the lessons learned while traveling in Paris, my family took a road trip to Bruges for a long weekend in June. Driving in the car was heavenly after the fiasco of the Thalys train to Paris. As the highway stretched before me with fields aligning each side, I could almost imagine us driving down I-35. To further complete the road-trip experience, we stopped off at a Texaco to fill the tank and grab lunch. We feasted on made-to-order sandwiches of freshly baked bread, grilled chicken, and crisp vegetables. It was kind of like Subway, if only Subway had a real bakery and a garden growing out back. The drive was only 2 ½ hours and as we approached the town, the sun started to shine with a warmth we had not encountered this year. Although the air was still crisp outside, its rays warmed the car to the point we had to turn on the A/C. Happiness is the first time (not the 100th time, like most of my friends in the U.S. are doing right now) you turn on the A/C of your car after a long winter. We pulled off the highway and started viewing close-encounters with dairy cows. I raised an eyebrow to my husband (the GPS has led us down questionable paths before – including instructions such as “board ferry”). But I decided to trust it and sat back to enjoy the small country two-lane road it directed us down. We had rented a gardenhome in the center of Bruges. After passing by a small suburban-like neighborhood complete with an Aldi grocery store, we discovered the hidden jewel that is Bruges. After centuries, Bruges is still walled off from the world. 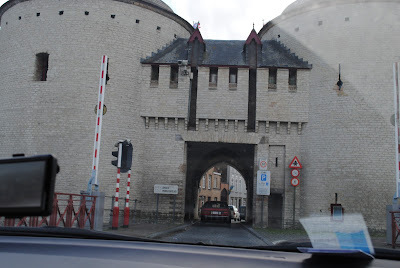 After curiously taking cues from the cars in front of us, we drove over the moat and through a large fortress-like gate into the town. We maneuvered the car down the tiny cobblestone streets and to our surprise, were able to easily find parking on the street. The streets were seemingly abandoned as we unloaded the car. My husband retrieved the house-owner’s instructions from the front door of her house and our family inquisitively walked around the block, found the walled garden in the back and unlocked door. Just like a secret garden, we were transported back in time and after tromping through the overgrown grasses, we found our tiny, but adequate garden home and entered. The house was built in the 18th century and the original stone fireplace still stood. It’s funny how the mind works. In a world of unfamiliar, my mind will often stretch to grasp the familiar in ways it may not normally reach so far. As we played house in a Bruges garden home built centuries ago, I felt a tug on my mind. The home reminded me of my grandmother’s home in Lubbock and the connection took a few days to pin-point: the floor was a rust-colored stone. The living room in my grandma’s house was a rust-colored brick. Despite the fact that she covered the brick with wall-to-wall carpeting when I was in elementary school, the memory still lingered in long-forgotten file cabinet of my mind. It just took an ancient house in Bruges to dust it off and recall it. All the guidebooks I had read described the town as an ideal backdrop for a fairytale. Walking through the town the next day, I would agree that Disney must have stolen the scenery for Rapunzel’s and Belle’s trips through town from Bruges. 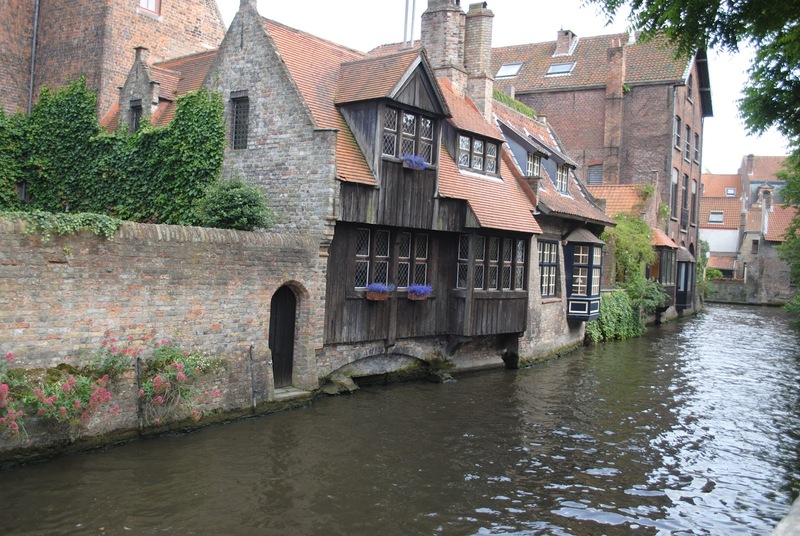 But beyond the architecture, Bruges reminded me of Disneyworld in many other ways. The primary modes of transportation were your feet, carriage rides, and boat rides through tiny picturesque canals. As we meandered through the streets, it did not feel as if any ‘real’ people lived there. Even the lady who owned the house we stayed in seemed more like a ‘cast member’ than a real resident. When she wasn’t bringing us breakfast, she was giving tours through the city. Everywhere you looked people were glancing at maps, speaking English, and taking photos. If you don’t like tourists, this is not the place for you. Since we’ve been living here, I found it extremely comforting. It was a quaint little town, small enough to see everything by walking, like Savannah in America. It has lots of history, some great sights, a few manageable museums, and great food. It wasn’t so overwhelming in that I didn’t feel guilty for taking a nap with my daughter on Saturday, while my over-excited husband and son wandered the town square and had a bottle. (V: beer, Baby: milk, of course). 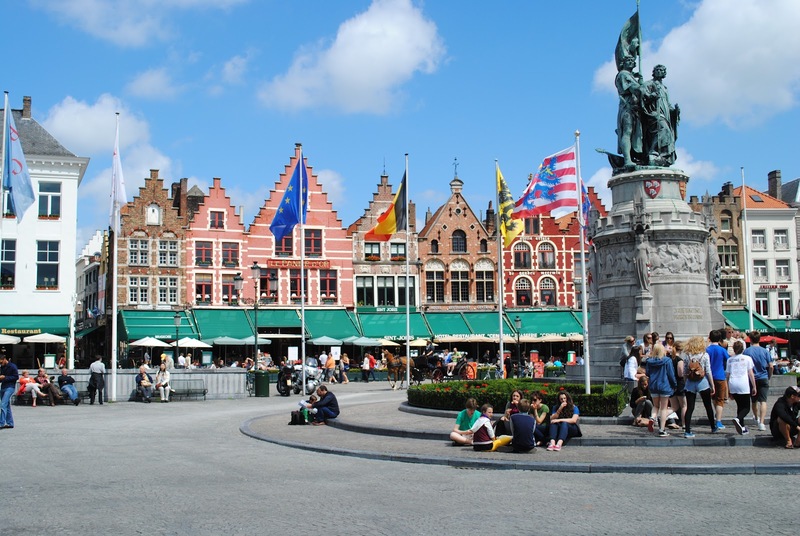 Belgium is proud of their fries, beer, chocolate, and waffles which is a recipe for some good old-fashioned family fun. Something for everyone, right?! 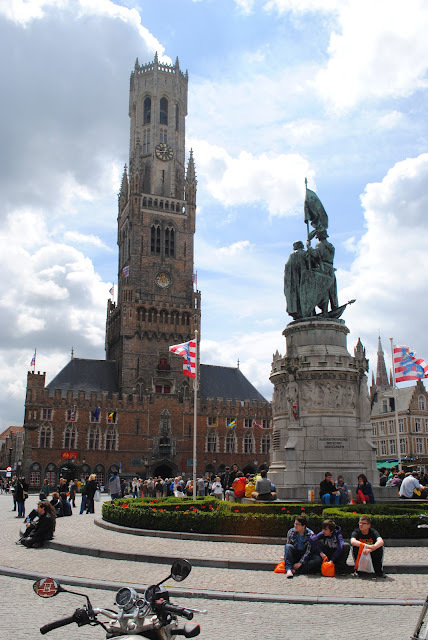 There are some nice restaurants and a brewery in Bruges and I would suggest checking out those sights if you are in town without children or at least with children old enough successfully enjoy evening hours between 5:00 p.m. and bedtime. We were not, so we opted for the, let’s-buy-a-variety-of-Belgian-beers-at-the-store-and drink-them-in-our-garden-home-after-the-kids-are-asleep-option. It may sound boring, but it wasn’t. It was relaxing, which, I think, it what Bruges is all about. We took a canal ride and giggled as baby ducks were playfully swimming/being run over by the current created from the boat. We had Italian and Egyptian take-out. We took video of our daughter dancing in the Markt. We shushed our children as we breathed in the peacefulness of the only remaining almshouse community in the city. We ate Belgian chocolates in the shape of letters in front of ancient churches with the bells ringing. Our favorite stop though, was the French Fry (Friets) museum. Beyond zoos and aquariums, there are few museums which can catch the interest of a two year old, but French Fries are on the list. We learned about the origin of the potato, the development of it as staple crop during the famines of the 1770s, and how they cook fries in Belgium. It’s a two-step process which involves beef and horse fat (it was enough information to spoil my appetite, I’d rather not know what fats they use to cook the potatoes in The Netherlands – ignorance is bliss). Late Monday afternoon after a full day of sightseeing, we loaded the car and pressed the Go Home button on the GPS. Happy and satisfied with the weekend adventure (without too much adventure), we queued up the Big Spring Texas Road Trip play-list I had created last fall. As we passed though Belgian and Dutch towns and farms, both kids slept soundly, and I turned to my husband and smiled. After months of pretending to be a resident in The Netherlands, casting ourselves in the role of Tourist from Texas, is just an easier part to play. I’m closing in on 6 months: 25% of this project down, 75% to go. The cell phone incident was kind of a turning point, if you will. Up until now, I think I’ve been thinking this is some (albeit, ridiculously stressful) vacation or maternity leave stint I’m on. On vacation, you don’t necessarily try to make friends or answer your cell phone. But you also don’t have to make hair appointments. As I wandered around AMS desperately I realized, no, this is no resort hotel. This is life. So, 6 months into this gig, I’ve decided/have been catapulted to shift from surviving to living. I remember talking to one of V’s co-workers last December at his company Christmas party. She and her husband had completed a 2-year rotation in London a few years back. She nodded wisely as I explained my excitement about the upcoming opportunity. “It takes 6 months before you’re. . . okay,” she said. I was surprised. Six months seems like an awfully long time. A few months after we moved here, while struggling with my new role as a stay-at-home mom, I reached out to one of V’s friends who is a stay-at-home-mom in Louisiana. She too reiterated that you need the 6-month rule to really find your groove. Closing in on the end of June, I was starting to get nervous. 6 months? Well, I was hoping that by July everything would be okay. I didn’t even feel close. Or is it compounded? Six months plus six months – oh good Lord, is it going to be December when I find my sanity again? This better not be so. Luckily, the sun has been shining for four straight days. (Previous to now, the record has been 2.5 days. Once.) It’s amazing what that kind of energy will do. I’m ready to run a half-marathon, clean out all my closets, and stop eating cheese at every meal. Not really, but it does make me happy, so that’s always a good thing. Reflecting on the progress so far, I believe there are three categories that I can conclude on: Things I’m Feeling Pretty Good About, Things I’m Still Getting Used To, and Things That I Still Don’t Get. I’m Feeling Pretty Good About: Shopping. HomeInLeiden.com is a website that I love. It has been an invaluable resource to getting us adjusted to life in Leiden as a family. It has a lot of resources to help find daycares, which restaurants are family-friendly, lists of playgroups, playgrounds, parks, babysitters, etc. It does have a small list of stores as to where to find children-related stuff such as clothes, highchairs, and books. But as far as where to find just everyday things, we were on our own. After months of searching and exploring, I can point you in the direction of pretty much anything you might need on a daily basis. I can proudly say that I have recently purchased ant bait, teacher’s gifts, and organic face scrub without having to go into multiple stores to find such things. Not everything is intuitive and not all stores are the same. For example, just because the Kruidvat on Haarleemerstraat in the center of town has travel size products, it does not necessarily mean the Kruidvat by the train station has travel size products. The Blokker in Rotterdam has lamps. The one in Leiden does not. The stores do strange things like that, which just keeps you guessing. The following is my list of what I’ve found to be Dutch equivalents to stores back home. Total Disclaimer: There is no store in this country that can compete with the amount of square footage in America. So, each of the entries below is an extremely rough comparison. I’ve even gotten the hang of the sizing. After successfully getting to the department store and finding the appropriate children’s section (meisjes kinderen), my other challenge was the European sizes. In March, while my daughter was at school, I bought her a Minnie Mouse t-shirt dress that I thought would fit. It was size 104. In a rush of excitement to dress everyone in the family for our first social event, I put it on her only to realize I was WAY off. Too late to change her, because as anyone with children knows, once the cartoon character is on their body there is no taking it off, we attended a 1st birthday party with my daughter wearing a dress down to her ankles that she will most likely be able to wear when we return home to the states in 2014. Once you know the system (the numbers correspond to the height of your child in centimeters), it’s actually simple. She is an 86, which means, a 104 is more the size of a 4-year old than a 2-year old. I’ve hidden Minnie Mouse in the back of her wardrobe to avoid a repeat. I’m Feeling Good About: Cooking. I LOVE cooking in this country. All vegetables and fruits are the freshest I’ve ever tasted. There are fields upon fields of greenhouses, so even in the wintertime; the produce is far superior to anything I would get at home. 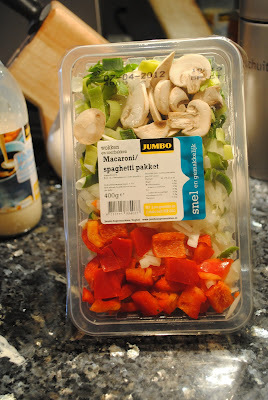 It’s also great because you can buy produce pre-washed, pre-cut, and in combinations that make it very easy to cook. For example, you can purchase “macaroni” packets, which include chopped leeks, red peppers, onion, and mushrooms. You just dump it in a pan and go. They also pre-cut chicken into pieces, which is fabulous, because I hate touching chicken. I mean, I don’t know anyone who does like touching chicken, but Kip blokjes is standard in this country. It does seem a little contradictory – you have to carry your pre-cut chicken pieces home on your bike. But whatever, it works. . So easy and I’m getting used to the fact that all produce will go bad within a few days of purchasing. Still Getting Used To: We have a mail slot in our front door. It is old, metal, and clangs. The first time I heard it, I thought someone was trying to break into our home. If you’re lucky enough to be in the hallway when the mailman comes, then you get to see a hand actually reaching through the door in addition to the vault-like clanging. For my American friends, let’s picture this again for just a moment. There’s a hand reaching through your front door. It’s enough to make you scream with surprise. Well, enough to make me scream with surprise. After my previous grocery store adventures, I'd imagined my photo up at the Jumbo break room with a caption that says ‘Crazy American Woman.” After screaming at the postal worker a few weeks ago, I’m sure my address is also up at the postal office break room with the same caption. Still Getting Used To: Understanding Dutch. 90% of my conversations can be filed into two categories: Either people are complimenting me on my children or they’re telling me what I’m doing wrong. Unfortunately the former is typically in Dutch, which I don’t completely understand, but I smile and nod appreciatively, and the latter is in English, which is just annoying. In a country where I do a lot of things wrong, the Dutch Directness is sometimes overwhelming. For example, my first interaction with a Dutch man went something like this: it’s my first week here and the heater in our bedroom is out. My husband had told me that the repair man was coming by, but I had forgotten because my children and I are still jet-lagged. My husband is at work and the doorbell rings at 8:30 a.m. I am in my flannel PJ pants, the ones with the tiny pink reindeer on them. I haven’t been outside our house yet. This is my big, empty fortress complete with its folding chairs and cardboard box end tables and I am determined to protect it and my children. There is no peep hole in our door, and honestly, even if there was, I probably wouldn’t be able to reach it anyway, seeing as I am the shortest female over 12 in this country. I don’t speak a lick of Dutch. I’m like that one house in the neighborhood. You’re on the other side, with your order form in your hand for your school fundraiser. An old lady opens the door a fraction of an inch, yells something at you in a language you don’t understand and then slams the door in your face. You think, really? You’re scared of me? But you slink away in your green beret and make a mental note to avoid that house during next year’s cookie sale. That’s me - the crazy lady who is scared to open her door, shouting things in a language not native to the country. Yes. I refuse to open the door and start talking to the man through the mail slot. Luckily, most everyone here speaks at least a little English. He says enough to remind me that he’s the repair man and is expected and I open the door to let him in. I’m holding my 3-month old baby and show him where the main heater is. My daughter (21 months old at the time) starts to cry. She wakes up and I’m in the middle of changing her on her changing table and the man asks me a question. Flustered, I show him the heater that’s out in the room next door and he takes the opportunity to lecture me. “You should never leave her like that. You never know what might happen.” Even our pediatrician at home only offers advice upon solicitation. Who does this heater-man think he is? I was livid. As if I didn’t know my own daughter. She’s not 8 months old, eager to flip off at any second. She knows what’s right and wrong and I know she’ll stay put. But, the more I’m here and the more I research, this is just part of the culture. No fuss. No holding back. They say what they want to say without fluff. I have to learn not to take things personally. Things I Just Don’t Get: Climate. Okay, fine. Call me Goldilocks, I deserve that. After six months of learning how to cope with the cold, it’s warm now. I’m excited because I'm wearing the short sleeved shirts and Capri pants that I imported. I have about 30 sundresses as well, but while Dutch women wear skirts on bikes, I’m just not sure that I’m ready to try to pull that one off. I wore some Steve Madden slip on shoes while cycling the other day and one fell off while pedaling down the street. I stopped my bike, picked it up, and pedaled the rest of the way home painfully barefoot as the spokes from the pedals dug into my skin. I decided to just throw those shoes away. I have no use for them here. There will be no blog post about me doing something as ridiculous as cycling with a skirt on. Pass. Up until now, my experience with living and sleeping with the windows open was limited to the handful of times the A/C went out in Texas and a week-long camping trip to Camp Goddard in the 5th grade. In The Netherlands, few houses are equipped with air-conditioning, so in order to cool your home during the warm months, you must open the windows. Surprisingly, unlike those rustic cabins in Oklahoma, there are no screens on the windows. I was briefly naïve enough to think, oh wow, there must not be that many bugs here. I was wrong. I’ve been constantly battling flies the size of bumblebees, invisible buzzing mosquitoes, and winged ants inside my house ever since the temperature rose high enough for these critters to join my house party. The winged ants invading my kitchen pre-7:00 a.m. last Saturday morning prompted another one of my "I'm-not-sure-if-I-can-do-this-moments", but luckily, I am expecting a visit from an exterminator early next week. After coming to terms with nature in the house, there's still the heat and humidity to contend with. We have large windows in the back of our house, which results in the Greenhouse Effect in our kitchen, living, and master bedroom. I think my children have inherited one of my husband’s genes. His cheeks will get red anytime it’s above 75 degrees outside. My face does not get red until after I run three miles in 100 degree heat and am about to pass out from heat exhaustion. Like I said, I’m pretty sure my daughter and son have my husband’s genes, but they just haven’t been around long enough for me to feel confident with this assessment. So as soon as my kids’ cheeks turn pink I start to flip out. The first time it got to 86 degrees outside, my son was roaming around the house in a diaper, still flushed. I attacked my husband, who had been chilled like a slab of meat in his office refrigerator all day, the moment he walked through the door. If there’s one thing this Texas girl knows, it’s that I like to be comfortable in my own home. The next day, we had a portable air-conditioner blowing and my baby had clothes on. In conclusion, I think we've come a long way in six months in establishing a foundation here in Leiden. I’m sure the next 18 months will bring new challenges and moments of confusion, but I feel confident that perhaps we are ready to embrace the task with more and more conviction each day. We’ve been thrown into the deep end and after six months of treading water to get our bearings, we could succumb to exhaustion and sink like stones. Instead, I think we are strong enough to start swimming, but we may still need our floaties.